Day started out a little rough, but ended on a once-in-a-lifetime note. Carb-loaded up at breakfast, then made tracks for Indianapolis, eager to get to the Indianapolis Motor Speedway. Been feeling a strong pull, partly, no doubt, because of the iconic nature of the place. The Indy 500 is part of the American fabric. Whatever the reason, knew I had to get there. Hit a detour a few miles into the ride, but eventually worked my way around that. Small things like this impact you on a bike in ways that riding in a car doesn’t. Got back on the frontage road and started feeling slack in the chain again. Then it snapped. 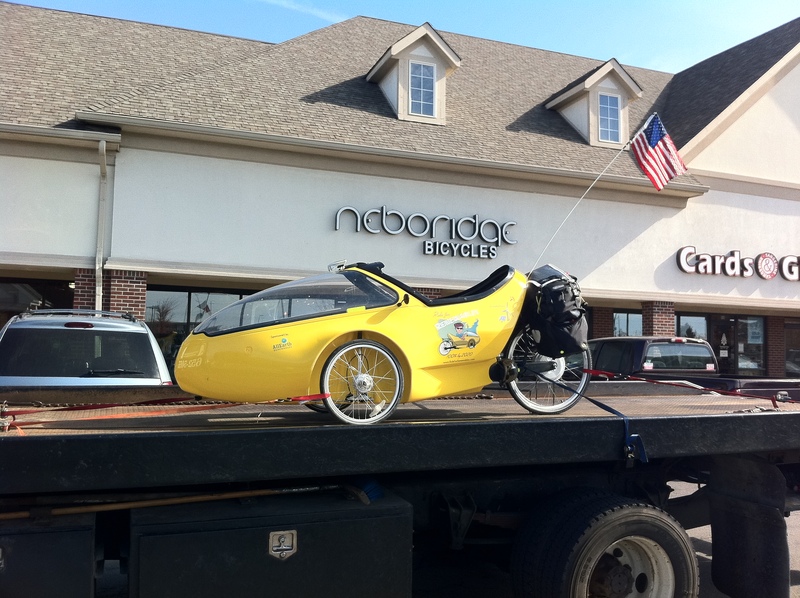 Repairing the chain on the rocket trike is not like repairing a chain on a regular bike, as half the chain is housed under the seat, which in turn is bolted to the carbon fiber body. It’s also very long and runs through two pulleys that guide it along the bottom. So called roadside bike assistance for the second time this trip to request a tow to the nearest bike shop. Luckily for me, it was just a short 8 miles away. As I waited at a truck stop (thanks for the mocha, Tina! ), got a call from a reporter at the Lebanon Reporter. The tow truck driver dropped me off at Nebo Ridge Bicycles, where I met a bunch of cool people (just seems to come with working at a bike shop). Want to give a big shout out to Brad, Jonathan, Brian, Joel and Tim for dropping what they were doing to get me back on the road. Required some acrobatics, but Brad managed to rethread the repaired chain through the rear pulley. Even though the job took about an hour, they didn’t charge me a dime. Was even treated to expresso (they have their own machine) while I waited. If you ever find yourself near Indianapolis, do yourself a favor and drop into the Nebo Ridge Bicycle Shop in Carmel. As I started pedaling away, felt the chain underneath yanking up on the seat. Reached under to figure out what was wrong and discovered a severed electrical cable (not good), which must have been cut when the chain snapped. Didn’t explain why the chain was pulling up on the seat, but needed to be fixed regardless. Brad directed me to a car stereo shop down the road that did electrical work. To repair the wiring, we had to remove the seat, which revealed the other problem. The chain was pulling up on the seat because it needed to be threaded through another pulley, which we then fixed (thanks, Chad). By now, was starting to wonder if I was ever going to make it to Indianapolis, but was back on the road, racing down busy streets towards my destination. Finally, there it was, similar to how I remembered it as a kid when my Dad brought me here oh so many years ago. The exit gate was open, but the entrance gate was closed. It was 5:15pm and they closed at 5:00. Couldn’t believe it, but something told me to just chill, so I parked the trike at the gate and walked around a little to get a better look at the track. Right about then, a vehicle rolls up the exit ramp. Sensing she probably worked there, I walked up and asked if there was any way I could get in. She told me if I was willing to drive (blindly) down the exit ramp, yes, but I wasn’t eager to be surprised by an oncoming car in my little trike. So she called a security guard inside, who agreed to hold the lane open for me if I hurried (thanks, Nadine!). Hopped in the trike and raced down the ramp and back up to the security building, where I had the pleasure of meeting Jim “Woody” Woodlock. We talked for several minutes and took some photos. Then I asked where I could get the best view of the track. He suggested I ride up to the front of the museum. As I was working on the best photo angle there, he yelled up that he had a “treat” for me, if I hurried. I abandoned the shot and rolled back down the hill, where he told me Ron was coming by to unlock the gate and take me onto the track, but we had to move fast, as he only had five minutes. I felt like a kid at Christmas. Ron then proceeded to give me a private tour of a lifetime. 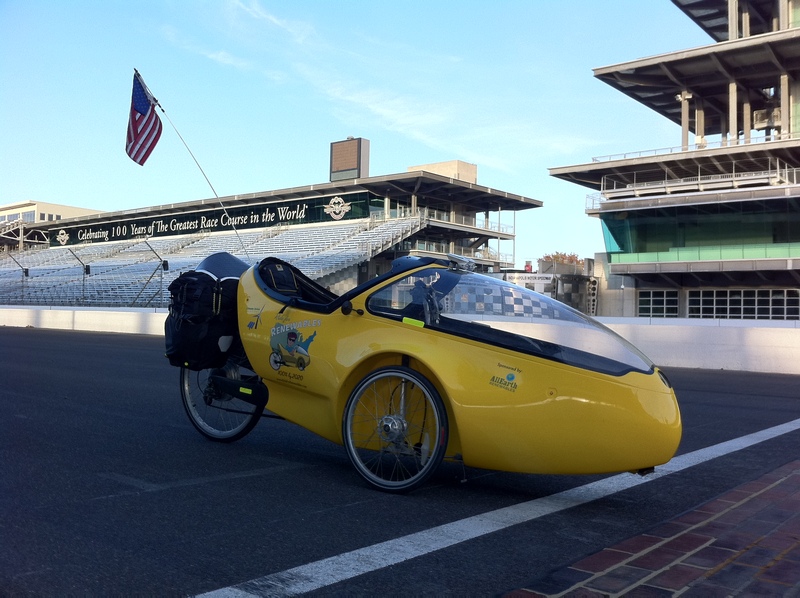 Here’s the rocket trike at the Indy 500 start line. What a thrill! I can’t thank you enough, Woody and Ron, for your amazing kindness and thoughtfulness. As I got ready to leave, Woody said to me with a smile, “This place has a lot of history, and now you’re part of it.” The rocket trike has been on hallowed ground. Raced in the fading light to yet another motel (which is busting my budget, but not a lot I can do about it – not a lot of campgrounds in big cities and towns). Couldn’t negotiate the trike down the narrow hallways and make the turn into the room, so the staff kindly offered to store it in the conference room and keep an eye on it for me (thanks, Dawn and John). Logged just 23 miles today, but have abandoned the need for big ride days. In fact, I’m no longer projecting when I’ll arrive in Washington, DC. I’ll get there when I get there. If I hit snow, I’ll just hole up for a while until it (hopefully) melts, then continue on my way. Got my “tricks” and “treats” today, in spades. Just had to wait a day. 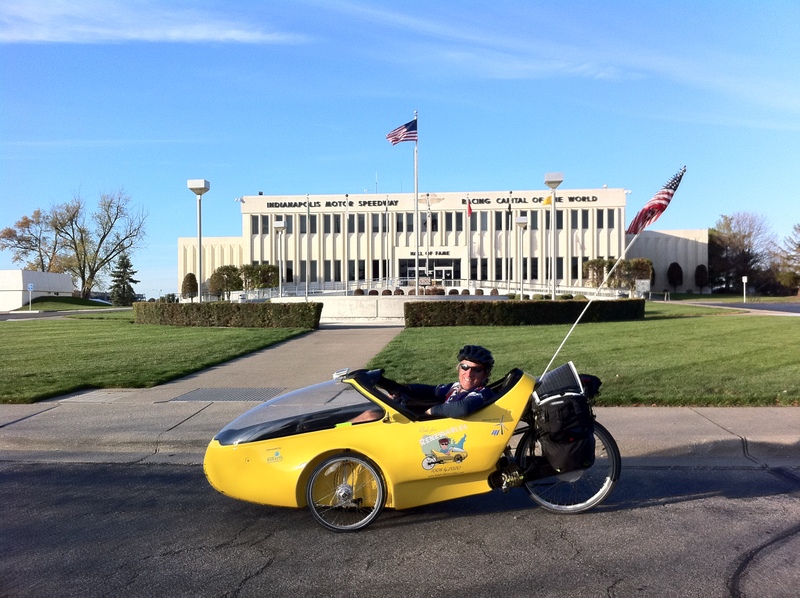 This entry was posted in 2010 Ride, Articles, Blog, Video and tagged indianapolis motor speedway, indy 500, nebo ridge bicycle shop, ride for renewables. Bookmark the permalink.